In today’s competitive scenario a lot of stress is laid on increasing productivity by using machine time effectively. In case of Vacuum coating, process time is difficult to reduce without compromising on quality (NOT acceptable). So reducing vacuum time (time required to create desired level of vacuum before starting operation) is the only option. For example- For a batch metallizer where cycle time is 30 minutes a saving of 3 minutes in vacuum time can increase productivity by as much as 10%. 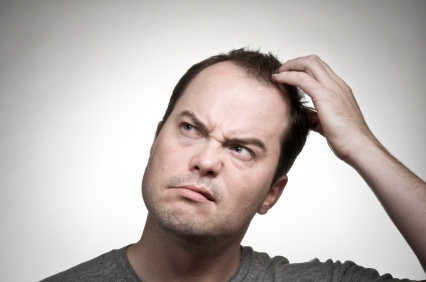 Production engineers therefore are always on a lookout for fine tuning the procedures to reduce vacuum time. 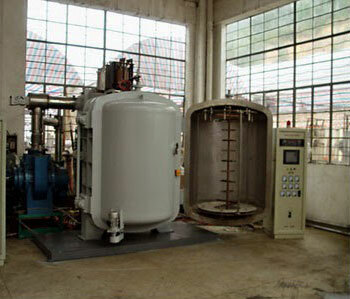 It is quite surprising that some engineers continue to use automotive oils or hydraulic oils to run Rotary Vacuum Pump. These oils have a lot of volatile impurities which are released when Rotary vacuum pump goes to its normal working temperature of about 800C. This results in rotary pump taking longer time to create vacuum and never achieving its full capacity to create vacuum. 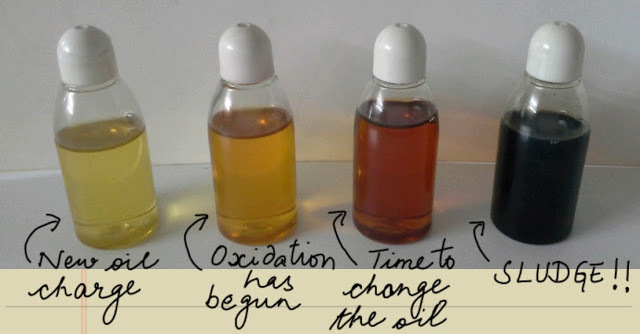 Also these oils have a lot of sulphur and other impurities that attack vacuum seals causing vacuum time to increase further. Since rotary vacuum pump forms the foundation of vacuum system using wrong oils over here affects the ultimate vacuum and vacuum time adversely. Good quality rotary vacuum pump oils like Premium Quality Synthetic Rotary Vacuum Pump Oil SV-77 can cut down vacuum time considerably and improve the ultimate vacuum also. Humble Vacuum Grease plays a very important role in sealing minor leakages. Minor leakages mostly go undetected but increase vacuum time. 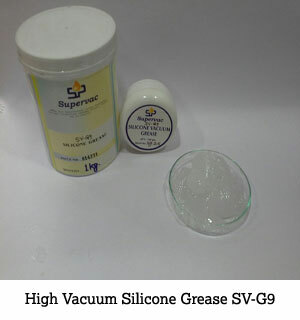 Using good quality vacuum grease like High Vacuum Silicone Grease SV-G9 on all O-rings and oil seals can go a long way in reducing vacuum time. This is particularly important on O-rings like main O-ring of vacuum chamber. For details please read a detailed blog post on this subject here. Properly cleaned vacuum chamber can reduce vacuum time by up to 15%. For details on how to do this, please refer to blog post Why is Cleaning of Vacuum Chamber Required? Since Diffusion pump is responsible for creation of high vacuum, so good quality diffusion pump oil goes a long way in improving efficiency of vacuum system. 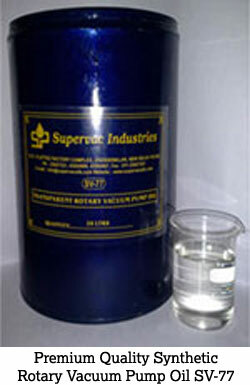 Silicone oils are preferable over messy and out dated hydrocarbon diffusion pump oils. Next generation Diffusion pump oils like High Vacuum Silicone Diffusion Pump Oil SV-SIGMA create very high vacuum quickly reducing overall vacuum time. Vacuum Chamber contains a lot of absorbed gasses and moisture on its surface. These get released under vacuum, increasing the cycle time. Baking the vacuum chamber at minimum temperature of 150o C for at least 4 hours under vacuum can result in removal of these gasses causing improvement of vacuum time by 10% to 15%. 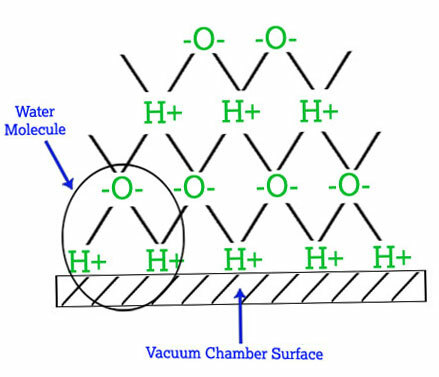 Moisture in vacuum chamber is most difficult of gasses to remove as water being polar in nature forms layers of absorbed moisture and these layers are held by static charge so difficult to remove. 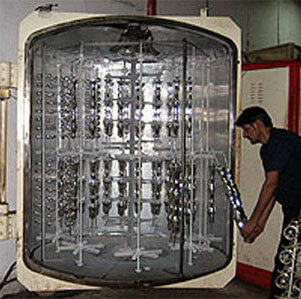 Air conditioning of metallizing area reduces the moisture and hence helps in improving vacuum time. As an alternative to air conditioner, dehumidifier can also be used. Substrate to be coated also has absorbed gasses and moisture on its surface. This gets released under vacuum. Release of gasses is further accelerated because of heat created by the heat source like evaporation boat or tungsten wire etc. which are employed to evaporate Aluminum. Pre Treatment of substrate may involve heating of substrate under vacuum prior to metallizing or simply storing it properly in low humidity atmosphere. (a) Vacuum chamber shouldn’t be a source of virtual leaks. Many times the design of system is such that from some part of vacuum chamber air is not able to escape freely. This results in pressure differential within vacuum chamber. 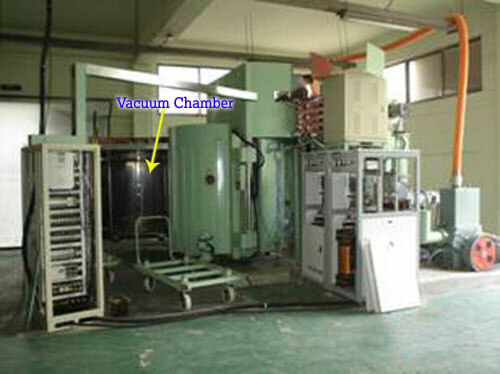 For example, vacuum chamber may have been pumped down to 1 x 10-5 Torr but a part of chamber from which free escape of air is not possible may have vacuum of only 1 x 10-2 Torr. Slowly when the vacuum will be equalized in the chamber, then this will show as a vacuum drop, resulting in time wastage with respect to vacuum time. Pumping system should always be designed taking into consideration the volume of vacuum chamber and gas load of the process. Sometimes to reduce costs pumping system capacity is sacrificed. This proves counterproductive. Also pumping system must have a Booster Pump between Rotary Vacuum Pump and Diffusion Pump to increase the pumping speed. If above mentioned ideas are applied diligently, vacuum time can be reduced and productivity increased by 10-15%. Not only this, implementing these ideas will also result in improvement in quality of metallization.